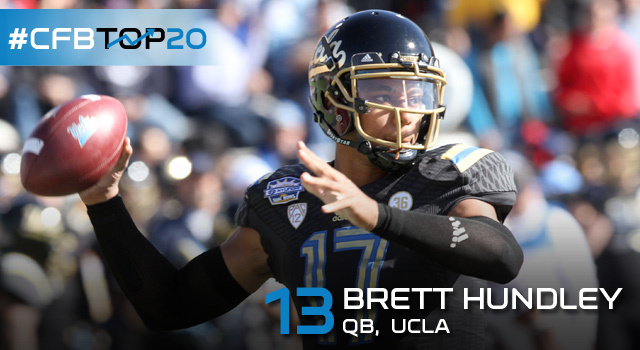 UCLA's rise up the polls the past few seasons has come in part because of the development of QB Brett Hundley. His head coach, Jim Mora, thinks he's a first-rounder and the NFL veteran isn't just saying that because Hundley is his guy. A dual-threat signal-caller, Hundley is a good runner who can elude defenders on the ground when he needs to but it's his quick trigger in the passing game that keeps defenses honest. He's grown leaps and bounds mentally the past two seasons and has all the tools to be in the Heisman conversation all season long in 2014. Our panel had no idea what to do with Hundley, which is surprising since he fits all the criteria for a top-10 talent: Heisman candidate on a potential title contender with NFL ability. Hundley was ranked as high as third by one of our panelists, received three top-10 votes, and went unranked by two of the seven voters. Definitely some regional bias detected. Where do fans rank Hundley? We asked Twitter and Facebook users who they considered the best player in college football. Hundley did pretty well for himself, garnering 11 percent of the more than 19,000 votes cast. Only three other players received a larger percentage (all still ranked ahead of Hundley in our countdown).